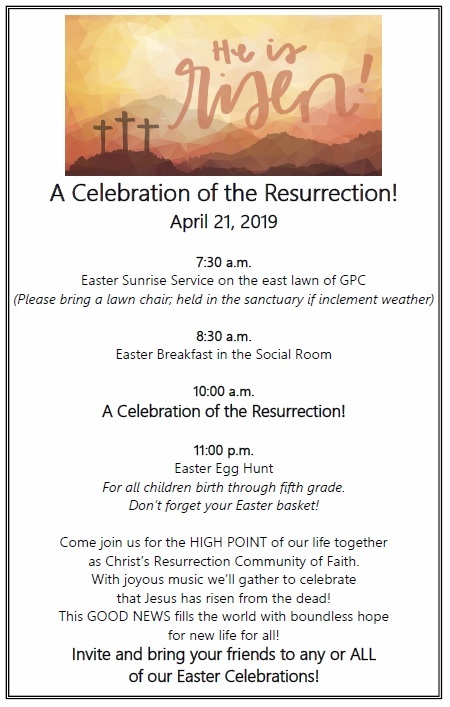 The Annual Congregational Meeting will be held in the sanctuary immediately following the worship service on Sunday, April 28, 2019. The meeting will include: the election of officers and the review of the 2018 Annual Report. Copies of the Annual Report are available in the side vestibule. One per family, please! Graduation Sunday will be celebrated on June 9. We invite all of our graduates to attend this day so we may honor you! Please contact Melissa in the church office if you have a graduate this year.